Ten financial services providers picked up awards at the second annual Irish Brokers Association Life Pensions and Investment Awards for Brokers, which were held in Dublin recently. The LPI Broker Awards were devised last year by the Irish Brokers Association as a means of ensuring that those at the forefront of the financial services industry were recognised for their expertise and critical advice they give to their clients. More than 500 people attended the awards ceremony, which was held in the Mansion House. Best Overall Broker: AON Employee Benefits. Commenting on the ‘Best Life and Pensions Broker’ title win, Ronan Goggin, MD of O’Leary Life & Pensions, said that the success was a testament to the firm’s client-focused business model. A hotel that found itself ‘underwater’, and which had to be bailed out by foreign money, was an apt spot for economist, David McWilliams, to expound on matters financial. The commentator attracted several hundred invited guests to an evening talk arranged by O’Leary Life and Pensions, for whom McWilliams pens a weekly investment note. Venue was the post-flood Kingsley Hotel, bought by the Chinese Kang family for around €6m. O’Leary Life and Pensions are looking towards a bright future after winning the prestigious Best Life and Pensions Broker Award in Ireland for 2015.The 2015 annual Life, Pensions & Investment Broker awards were held in Dublin’s Mansion House recently. 530 industry professionals from Ireland’s financial services sector gathered together to identify and commend those professionals who provide their clients with the highest levels of advice & service.O’Leary Life and Pensions headquartered in Cork, is part of the O’Leary Insurance Group (Est 1961) which employs over 200 staff operating from 9 locations across Ireland. O’Leary Life and Pensions has evolved into one of the largest and most successful life, pensions and investments brokers in Ireland. They also maintain an ongoing association with renowned economist David McWilliams who authors a weekly investment note for their clients.Managing Director of O’Leary Life & Pensions, Ronan Goggin said, “We’re delighted to win this prestigious award as recognition from our peers that we’re operating at the forefront of our industry. It’s also testament to our business priority as being client focused” said Ronan Goggin, Managing Director of O’Leary Life & PensionsOur company has been in business for almost 45 years. Throughout that time, we have built a dedicated team that is focused on providing long term financial security to our loyal client base. O’Leary Life & Pensions, one of Ireland’s largest financial services companies hosted a client event, titled an “Evening with David McWilliams”. The event was part of an on-going association O’Leary Life & Pensions maintains with David McWilliams, as he authors a weekly investment report for the firm’s clients. The renowned economist attracted several hundred invited guests, eager to garner his views on the Global economic outlook, coupled with more localised issues, such as his recent appearance at the banking tribunal. Topics on the night covered the recovery in the US and UK economies to the possibility of Britain leaving the EU, and its impact on Ireland as a major trading partner. Specifically on the Irish recovery, McWilliams remains upbeat and whilst noting caution in certain areas, believes there is further to run on this positive story. His specific notes of caution however focused primarily on the potential members of Ireland’s future governments, and the negative impacts some member parties could levy on business sectors, most specifically SMEs. O’Leary Life & Pensions, one of Ireland’s largest financial services companies, founded by Bandon man Tim Goggin with Archie O’Leary over 40 years ago, was last month voted Best Life & Pensions Broker in Ireland for 2015. The 2015 annual Life, Pensions & Investment Broker awards were held in Dublin’s Mansion House where 530 industry professionals from Ireland’s financial services sector gathered to identify and salute those professionals who provide their clients with the highest levels of advice and service. O’Leary Life & Pensions, headquartered in Cork, is part of the O’Leary Insurance Group (Est 1961) which employs over 200 staff operating from nine locations across Ireland including Bandon & Clonakilty. Since its foundation in 1973, O’Leary Life & Pensions has evolved into one of the most successful life, pensions and investments brokers in Ireland. 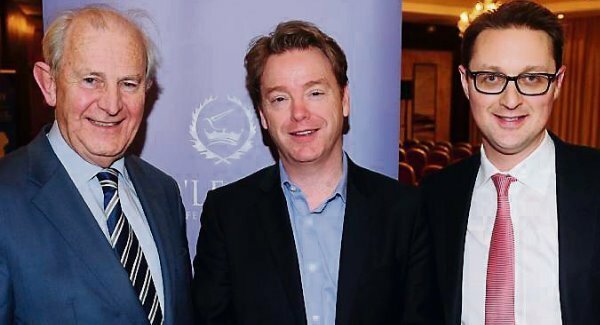 Having successfully presided over the business for almost 40 years, Tim Goggin now shares the running of the company with his two sons, Ronan and Brian, and together they have developed a number of unique facets to the business, including having on board renowned economist David McWilliams who authors a weekly investment note for their clients.